Weiler is family-owned global leader in abrasives, operating for more than 70 years. However, isolated working conditions and insufficient brand emphasis had resulted in a lack of knowledge – and, subsequently, pride – of their legacy. Spillman Farmer recognized the renovation of their facility as an opportunity to unify Weiler’s workforce and physical infrastructure to facilitate collaboration, efficiency, and collective identity. A focus of Weiler’s new corporate philosophy was to encourage discussion and collaboration, so the team worked closely with Weiler leadership and staff to reflect this identity through design. Some of the concerns Weiler had with their current building and configuration were poor views, redundant resources, and isolated departments (Accounting, IT, Marketing, Sales, Customer Services, Supply Chain, and Production). The majority of the workspaces and touch-down spaces have an open-concept feel, allowing for collaboration between and among departments. Meeting rooms integrated writable surfaces, which allow employees to write ideas and sketch plans on the walls and movable storage. An in-house café creates opportunities for staff to interface and collaborate serendipitously. The company’s new “grandstand” features tiered seating in front of a large video wall, used for company training, presentations, and celebrations. Recognizing a need for private offices and workspaces, the team located these spaces within the interior of the floorplan, allowing for better views and sharing of natural light on all four sides of the building. In addition, resources were consolidated into shared service and amenities areas, encouraging interaction between departments and creating additional cost savings. 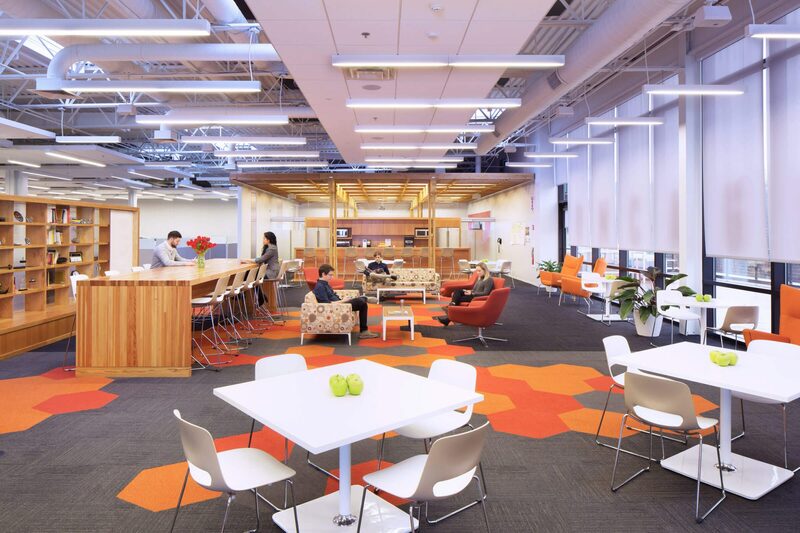 Throughout the design, the team took a people-centered approach, focusing on spaces that are full of natural light, utilize flexible furniture and work stations, and that can evolve and adapt to support the innovation taking place within. The Weiler renovation and expansion project helped the client advance their bottom line. The reprogramming of the space allowed for physical barriers to be removed, which has since facilitated a breakdown of silos in the workplace. The efficiencies created by the new floorplan layout allow employees to react more quickly to customer needs. Decision-making has been expedited, and innovation among the employees has grown as a result of the adjacencies and collaborative touch-down spaces that provide employees with opportunities to interact. Following the renovations, Weiler has boosted productivity and increased their direct field sales support by 60 percent. Architecturally, program elements are organized into a kit of volumes with usage denoted by industrial plywood cladding and brand color for ease of wayfinding. The renovation has transformed Weiler’s dark, cluttered offices into an interior landscape for innovation. This renovation of the existing Weiler HQ creates a vibrant workplace, that with its rich variety of work and social spaces is sure to be an energizing influence to this company. The warm and fresh palette of its materials impart a relaxed human touch of to what is an otherwise highly efficient office configuration. The engaging character and feel of its diverse array of common spaces evidence a very thoughtful people-centered approach to design.